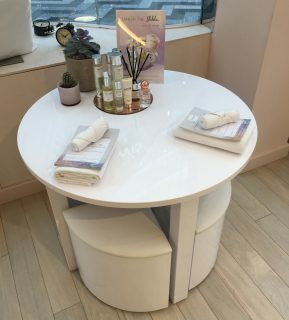 Late last week, I decided to pay a visit to Neom Organics and was pleasantly surprised to learn more about Sleeptember! Taking the time to experience the store in its entirety, I had a chat with a member of staff to truly understand the brand’s most prominent store in the beautiful Victoria Quarter. 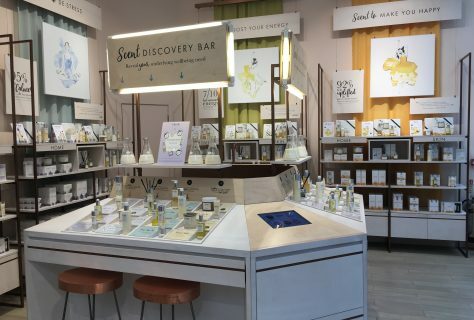 I was most intrigued by the ‘Scent Discovery Bar’ - the experiential element of the new store which has featured in many articles and became a key reason for my visit! 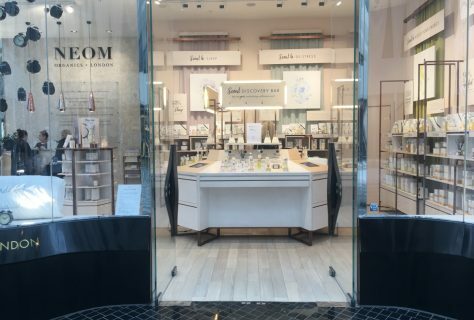 It sits just inside the entrance of the store and this prominent location of the bar turns the meet-and-greet area into an educational introduction to the brand; equally important for new customers of Neom, those looking for a change-up in their usual purchase or even just general browsers. The bar itself doesn’t need too much explanation, but I was helped by a member of staff to truly understand the benefits of discovery. An invitational heading ‘Reveal your underlying wellbeing need” points downwards to four scientific beakers filled with scent. No labels, no giveaways as to what the scent was and absolutely nothing to read. The experiment is purely based on smell. The experience is supposed to take 30 seconds and whilst mine took longer as I chatted to the store assistant, it could easily be done in a 30 second window; providing a very simple process that takes you on a journey of discovery. THE SOFT METALICS AND HANDDRAWN GRAPHICS. 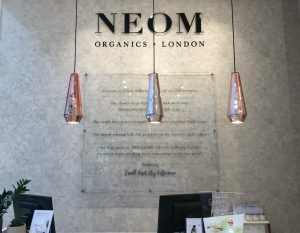 I had seen plenty of photographs of the Neom Organics store so whilst I knew the key elements to expect, the first-hand experience led to a true understanding of how the space worked. Looking past the scent discovery bar, your eyes are immediately drawn to the use of soft metallic features. White washed unitary is finished with copper edges, the light fittings are a mix of brushed silver and rose gold and finally the stools are topped with rustic copper seats. All of this against a muted colour palette with textured greys and soft nudes – it’s calm but incredibly impactful. Each range had its own brightly coloured backdrop, standing out amongst the tranquil nature of the store. For instance, ‘Scent to make you happy’ uses an uplifting yellow colour palette, with an energetic hand-drawn graphic and some really interesting statistics – “92% felt uplifted and in a better mood”. This is mirrored throughout all four ranges, with products neatly stacked beneath the graphic communications. With so many beauty and home stores cropping up across the glove, Neom encapsulates the essence of both (if you’ve only heard about their candles, check out their full range, I had no idea!) with a tranquil and methodical approach. "Smash the shhh out of sleep"
Okay, so you may have noticed that I used the phase 'Sleeptember' in the title, so it's time to discuss this a little more! It was hard to miss the campaign when arriving at the store, with a cascading waterfall of alarm clocks making a statement in the window displays. Inside the store, the campaign became more prominent but it was still worth continuing my chat with the store assistant to learn a bit more. Whilst sleep is already one of their defined ranges, this month has a particular focus on the importance of a good nights rest. A dedicated space in-store features the sleep range, with an exclusive book written by Neom sleep guru Anandi. However, it's not the products which caught our attention, it was the idea of Sleeptember manifested in physical retail which really interested us. This is where we asked a few questions! Throughout September the store will be transformed into a 'Sleep School'. 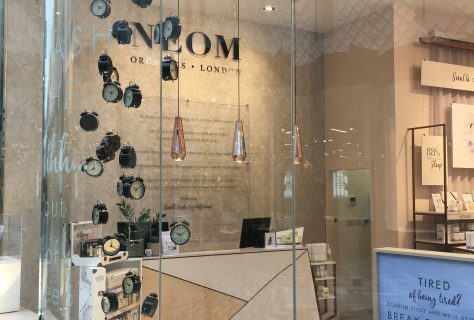 Customers can book complimentary sessions at the sleep school and learn more about the importance of a good nights kip, with tips and tricks directly from the Neom experts. It all leads up to the #NeomBigSleep on the 28th September which we're eager to know more about - I was advised to keep an eye on their blog! 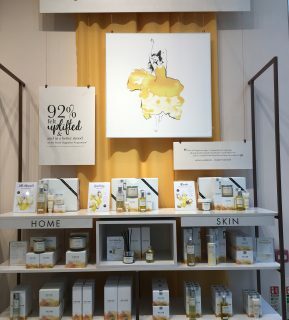 This sleep-related campaign is also promoted on social media with customers encouraged to use the hashtag for online sharing, posting pictures of their Sleep School visit and their interaction with the Neom store; actively engaging with the Leeds store as well as the Neom brand overall. The cascading clocks may be the eye-catcher for Sleeptember in-store, but the whole campaign focuses is truly holistic from offline to online channels. We visit stores on a regular basis, often for research and insight, sometimes just for pure interest in the brands opening them. 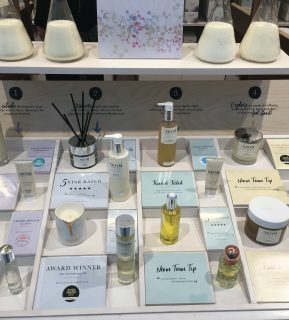 However, it was a treat to be able to speak with a Neom representative and really understand the rationale behind various moments in the Leeds store. Keep an eye out for our next 'on the road' post!